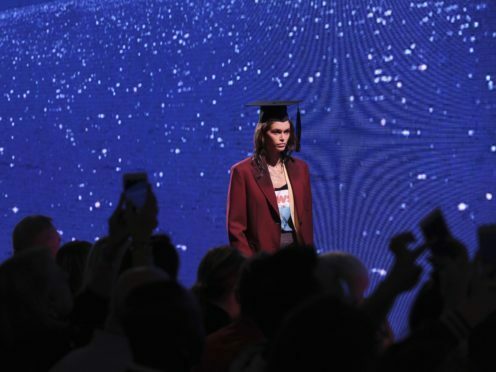 Kaia Gerber continued her busy New York Fashion Week schedule by walking the Calvin Klein runway wearing a graduation-inspired outfit. The teenage model appeared in the Coach 1941 show before heading straight to the Calvin Klein runway where she wore a mortar board and an oversized blazer, completing the look with a pair of pleated mauve trousers and pink heels. The 17-year-old later posted a photo of herself to Instagram. graduating @calvinklein tonight ❤️ thank you to the amazing team that is Raf, @pieter_mulier, @matthieu_blazy, #olivierrizzo, and @ashleybrokaw. everything you do amazes me and I cannot tell you how happy I am to be a part of your family. She wrote: “Graduating @calvinklein tonight. Thank you to the amazing team that is Raf [Simons], @pieter_mulier, @matthieu_blazy, #olivierrizzo, and @ashleybrokaw. Her post was liked more than 70,000 times in five hours. The teenager, daughter of American supermodel Cindy Crawford and entertainment mogul and model Rande Gerber, has worked with Calvin Klein and Belgian designer Raf Simons. She made her debut NYFW walk for the US fashion house in 2017 during the launch of Simons’ Calvin Klein Collection. Gerber has also modelled for Vogue, Teen Vogue and Pop magazine. She was offered her first modelling job at the age of 10 by Young Versace, the fashion house’s youth line.